Can we feed 9+ billion people? 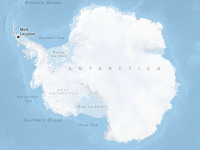 Can we adapt to climate change? And, what techniques are the wisest to use? 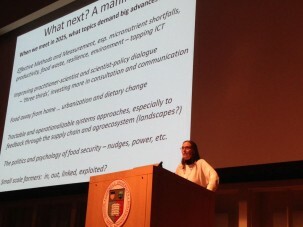 More than 500 people from 67 countries came together to address these issues and more in October at the 2nd International Conference on Global Food Security, held at Cornell University in Ithaca, N.Y. The overall aim: How to achieve global food security while reconciling demands on the environment. 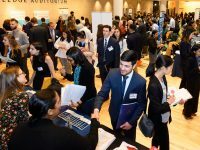 The gathering was organized around 11 thematic topics, which have been analyzed in detail through the Economics that Really Matters blog (see below). In order to address the question of feeding 9 billion people, the Earth Institute’s Agriculture and Food Security Center post-doctoral research fellow, Aurelie Harou, along with Modesta Nnedinso Abugu, a fellow at the Cornell Alliance for Science, conclude that while there is no simple solution, technology will play a necessary role in our future ability to feed the planet. Critical technologies include genetic engineering for increased nutritional value of crops, computational advances such as cloud computing to enhance research in terms of mapping agricultural fields, and a wide range of food production and processing technologies to reduce harvest loss. 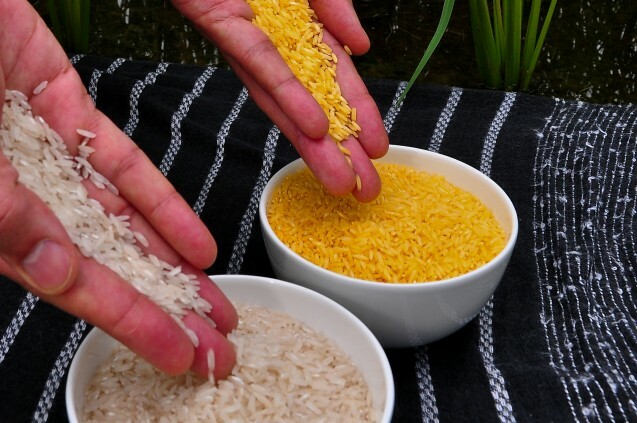 Golden rice is a prime example of genetically engineering crops to improve human nutrition. Named for its yellow color, this variety of rice has been genetically modified with beta carotene to increase vitamin A content. This could potentially prevent hundreds of thousands of cases of blindness. However, pushback from consumers and advocates has led to limited cultivation. Adapting to climate change is an ever-critical question for agriculture and our food systems. Pinki Mondal, senior research associate at the Earth Institute’s CIESIN, and Anna Savelyeva, a food policy graduate of City University London, start by asking if it’s possible to reduce the risks to food systems, and what is climate smart agriculture and its role in our adaptation? Climate change is expected to reduce crop productivity as temperatures rise, create food shocks during climatic events, and change the distribution of pests and invasive species. The impact of climate will vary spatially worldwide; while certain regions will benefit from increased precipitation and temperatures (like winter crops in Europe), other regions are expected to see a reduction in yields (like India and Sri Lanka). This data indicates that adaptations must be region-specific. What about “Climate-smart agriculture”? The idea behind this is to take an integrative, multi-level approach to address barriers to reducing risks of climate change on agriculture and develop location- and context-specific solutions for producers. A successful approach brings together local knowledge and traditional practices to regional and national policies. Adding to the dynamic of increasing population and global climate change is the question of sustainably increasing production. Erwin Knippenberg of Cornell’s Dyson School and Danielle Neidermaier of the Peace Corps try to answer the question: Was Malthus right? Are we doomed to a future of famine because food production cannot match population growth? Places like China have plateaued yields, whereas sub-Saharan Africa has production well below potential. How can we bring those yields up while mitigating the negative impacts of increasing production? One such example would be to transport nutrients from surplus areas to sinks to offset as much as 100 percent of fertilizer needs in nutrient deficient areas. Another would be for farmers to use agro-ecological approaches to improve food and nutritional security, soil health and biodiversity. The International Conference on Global Food Security was organized by Elsevier and co-chaired by Chris Barrett of Cornell University and Cheryl Palm of Columbia University. Theme 6: Technological breakthroughs to help feed 9+ billion—How Can the World Feed 9 Billion People? Theme 8: Reducing risk factors to food production and distribution from climate change—Can We Climate-proof Global Food Systems? Janelle Sommerville works at the Agriculture and Food Security Center.